i was wondering if anyone is using this and how its working out. any sort of piggyback tuning system isn't the best when it comes to tuning for turbo, because its only tricking the ECU into thinking its getting different readings. if your spending all that dough on going forced induction, just get a good reliable tuning system, like a chipped ECU, and GET IT TUNED!! the aem f/ic is different than most piggybacks though, insted of taking the signals from the sensors and altering them before it sends them to the ECU, it takes the signals from the ECU and adds or subtracts a presentage (baced on a preset map) and sends the new signal to the fuel pump and ignition. it's the best option for our cars when you are in the situation where you are forced to use a piggyback. like you want to keep your ATTS for example. results in fewer engine codes and the car won't "untune" itself like with other piggybacks. listen to neck, he knows his ****. he's blown enough motors to know how to do it right now.. either way, its still based on a preset map. which is stupid to run in the first place. they are FAR from perfect. every setup is different so preset maps wont work for every setup. you cant expect a preset map to work for a long time for that matter. you cannot beat a chipped and tuned ECU. its the safest and most reliable way to go. especially with forced induction, you don't want to go the cheep way out. Last edited by Beaker; 03-17-2008 at 01:16 PM. i wanna do some research on it tho, i'll let ya know. Seriously, I know NOTHING about tuning softwares and ish. This might be a pretty safe and reliable alternative to a chipped ECU or a full standalone, but it might not be as well. Since PreludeZone is a VERY new forum, we dont have as much info as other sites such as Honda-Tech that has been around for prolly about 15-20 years. yea idk how comfortable i would feel using a brand new system for the MOST important part of the car. but if you do end up going this route, let us know how it goes, i'm intrigued. Last edited by t4lude98; 05-28-2008 at 08:00 PM. nice. do you have the aem wideband or will it work with any wideband? did you tune it urself? do you know where i can get the software to play with? hmmm.. are you running pretty big injectors? have you ever used any other piggybacks? Last edited by 2keggie; 07-09-2008 at 11:34 PM. wut cat? open or closed dt? Last edited by t4lude98; 08-11-2008 at 09:37 PM. seems kinda low bro. something doesn't seem rite. log mani's have been known to hold up to ~400hp, no problem. i think you just have a TINYYY turbo, cuz mostly all kits that come with everything usually come with pretty small turbo's. 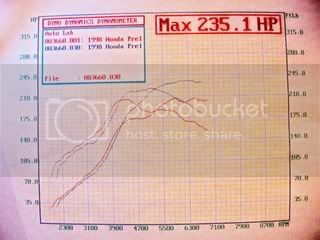 for comparisons sake, an H23 @ 8psi on a t3/to4e usually puts out 240hp/tq, which is 2 less psi, and they also have 40 less hp stock. your engine is def built to handle 400hp easily, it just sounds like the turbo (and injectors) are holding you back from some serious power. try to figure out what kinda snail you have tho. also... was this professionally tuned? or just street tuned by yourself? i think both the turbo and the injectors can support just over 300.